The American Academy of Cosmetic Dentistry (AACD) values the importance of strong, cohesive working relationships between the Academy and the dental schools. The Academy offers educational opportunities to dental schools, dental students, dental school faculty, and young professionals around the globe. AACD knows you're on a tight budget, so dental students can join AACD and receive most benefits of membership for only $60 a year. And full-time dental faculty (non-practicing dentists) can become AACD members for only $135 annually. Join today. Without the dedication and passion of the dental community, the advancements of cosmetic dentistry would not be where they are today. 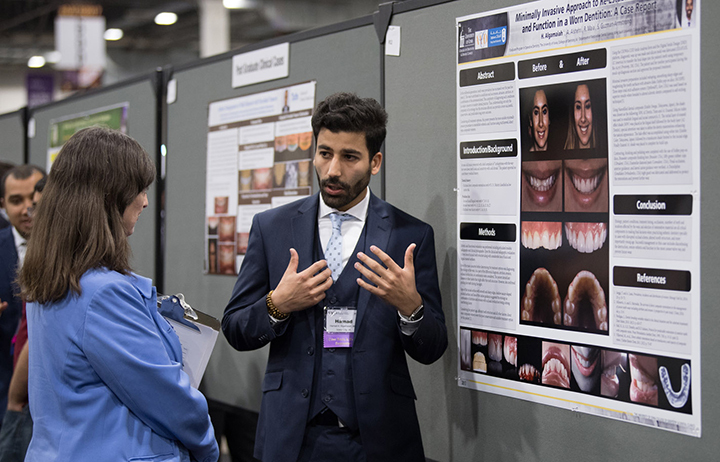 The AACD International Poster Session creates an outlet for students, clinicians, researchers, and international dental faculty to share their scientific findings and to promote greater interaction within the dental community. More here. Volunteer lecturers and successful practitioners visit dental students at select campuses to speak on responsible esthetic dentistry, the importance of continuing education, the career options beyond graduation, and explain the value of Accreditation in AACD. Learn More. AACD has gathered some of its most requested free downloadable references and resources and put them into a single location for easy access. Click here.